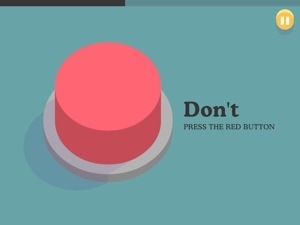 You wanna push it, don’t you? Admit it. C’mon, it’s safe to do so. You know you’re tempted. I want to set up this as a gag in a mall somewhere and watch people react to it. For every time someone pushes it, I think it would be so fun to have something new happen. All good stuff–things that would bring joy like balloons and confetti dropping out of the ceiling or a band covering “Bohemian Rhapsody” to start playing. How do you answer that question? For me, I know there is no answer that I’m okay with having. And, my answers will probably make people mad. Honestly, I don’t like thinking about this question. Who wants to think about how they would ever turn away from those in need, be it poverty, disease, or hunger? I’m only going to feel and look like a monster. Tangent time. How often do you really, TRULY enter into self-reflection and diagnose yourself (or hear The Holy Spirit tell you) that you have a characteristic, lifestyle choice, or complete way of life that is in need of fixing? There are very few people who are willing to do a major overhaul in life to address this. This is, perhaps, a major reason why the majority of us who follow Jesus make that decision prior to turning 18. (The statistics are staggering for how many people choose to follow Christ in their teens instead of when they are older.) Once we hit adulthood and have “found ourselves,” laid the groundwork for our lifestyle, and raise families in ways we think best, very few of us change in major ways. We “settle down” and don’t do much changing after that. This isn’t necessarily good or bad, it’s just how adults seem to be wired. Enough beating around the bush for me. What are those temptations that rule me and make me turn away from those in need? I chased that tangent above because I’m nervous about where the answer might take me. Speaking about answering the question…. My concern for my family’s safety is a temptation that makes me turn from helping those in need. On the surface, it might not seem like it’s a temptation, but I argue that it is. No one would say they get tempted by “being safe,” but we do get tempted by fear. The temptation at the heart of fear is to find security in something other than God’s protection. It’s lack of trusting in God’s provision. I can’t give you a specific way that I’m tempted by this, other than where I live. I reside in apple pie suburbia. The schools are top quality and the strip malls offer me all sorts of goods and services. It’s a super safe place to raise a family. I really love it here. My kids can play with the neighbors in the cul-de-sac and I’m not worried about them (too much)! There is nothing evil about living in the burbs. In fact, there is plenty of poverty, disease, and hunger here–and not just spiritual poverty/disease/hunger, either. It might not be as blatant as the homeless gentleman I gave a couple of bags of tortilla chips to tonight, but it’s there. Sociology is noticing trends of the poor moving out of the city and into suburbia because of gentrification–the rise in prices in urban areas because of revitalization and the cool factor of living downtown. But, it’s no secret that avoiding poverty is much, much easier to do in the burbs than elsewhere. So to get specific for you and how I’ve bended to fear: I haven’t taken my family to serve together in situations where a stronger level of poverty exists. I take teenagers to a ministry in downtown KCMO often enough and I’ve thought about having my 5 year old come along with us. (As all little kids do, she doesn’t see poverty yet. She just sees people and potential playmates.) I haven’t ever taken her because I worried about her safety–even though I would look after her, 20 teenagers who think she’s adorable would look after her, and plenty of people I trust down there would look after her. But I’ve never brought her. In the name of safety. What am I afraid of? That she’ll see someone who shows up for the lunch/clothing giveaway and is drunk? Am I scarred that she’ll make friends with another girl who is a part of a homeless family? Not when you put it on paper…but enough to have her stay at home. One of the things I pray for both of my kids is that they have BIG Kingdom-oriented hearts for people. I want them to be lovers of The Christ and His people. If I really want God to answer one of my top prayers for them, I need to put my money where my mouth is. God doesn’t expect us to be stupid and walk the streets late at night. 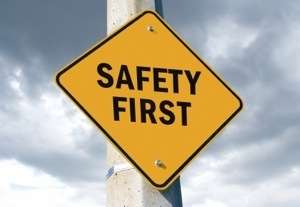 God expects us to take care of ourselves in responsible ways, including our safety. But if we claim to follow The Christ, we best remember that He told us to carry our cross if we expect to be His disciple. Carrying an instrument of tortuous death is not exactly safe. Safety can become an idol just like Baal, money, power, or celebrity worship. Taking down the idolatry of safety extends to having families, too. Again, it does not mean that I don’t keep my daughters safe. It means that I do not let fear rule my heart when it comes to engaging poverty, disease, and hunger. I am not as good of a dad and disciple if I do not help my daughters see that poverty is not as big as our God. If perfect love casts out fear, we should be less tempted be afraid of people who are shackled by poverty, disease, and hunger. Sometimes in Scripture, the unsafe disasters brought God’s people together. We find Jesus among people fighting disease and hunger in their lives. Check out the story of Legion in Luke 8:26-39. Jesus comes across this wild dude who was named Legion because of how many demons were possessing him. He had chains binding him and he cut himself. Legion was definitely not safe. But after Jesus sent the demons into a herd of pigs, Legion had a personality turnaround. He became calm and attentive. It ended up that he just wanted the same basic needs we all have: the love and acceptance of Jesus. Who is around you that isn’t classified as “safe” but needs your attention? Don’t be tempted by fear. We have a God who has watched over His people through countless genocides, persecutions, and calamities. He will sustain you. My friends and I are posting during Lent again. 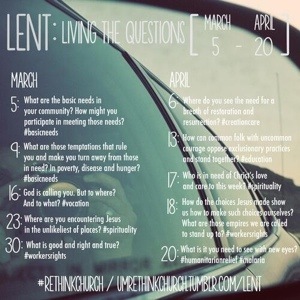 In the words of Bones, “I guess crazy sticks together.” Lent has forty days and we’ll be answering ten questions each Wednesday (or later, as in my case today. See what the others have said, because I love listening to them, too! This entry was posted in #10questions6voices, #1Word5voices, faith, Lent and tagged #10questions6voices, #1Word5voices, faith, Lent. Bookmark the permalink.